Oct 24, 2015 @ 09:00 AM — by Sharon B. Mateja, D.D.S. It can happen suddenly and without warning. Suddenly, you feel a gritty feeling in your mouth as a piece of your natural tooth structure comes loose. When you look in the mirror, your fear is confirmed: you have chipped a tooth. A chipped tooth can be a source of self-consciousness and anxiety. Not only can it affect your appearance, a chipped tooth can actually increase the risk tooth decay, root canal infection, and other dental problems. This is why it is so important to seek treatment as soon as possible. At the practice of Sharon B. Mateja, DDS, we offer a range of restorative dentistry treatments to replace your lost tooth structure. To learn more about the causes, and undergo treatment for chipped teeth, contact our Rancho Cucamonga, CA practice today. Falls: If a patient falls and is unable to break his or her fall with the hands, the patient may chip a tooth. Sporting activities: Athletes are at a higher risk of chipping their teeth. To avoid getting a tooth chipped due to contact with another player or piece of sporting equipment, wear a custom mouth guard. Bruxism: Bruxism, or chronic teeth grinding, places excessive pressure on the teeth. This can put patients at an increased risk of chipping their teeth, especially a molar. Wearing a custom mouth guard at night can reduce this risk. Eating hard foods: Eating particularly hard foods or chewing on ice can chip a tooth. Chewing on inedible items: Habitually chewing on pen caps or your nails can weaken the teeth and make them prone to chips. Assault: Being involved in a fight can increase the risk of mouth injuries such as a chipped tooth. Porcelain veneers: If you chipped one of the front facing teeth, and the damage is mild to moderate, a porcelain veneer may be placed to mask the chip and improve the appearance of the smile. The veneer is custom made out of dental porcelain, and then applied to the tooth using dental cement. Dental bonding: Dental bonding involves the application of a composite resin material. The resin is used to replace the lost tooth structure. It is applied in layers, and hardened with a curing light. 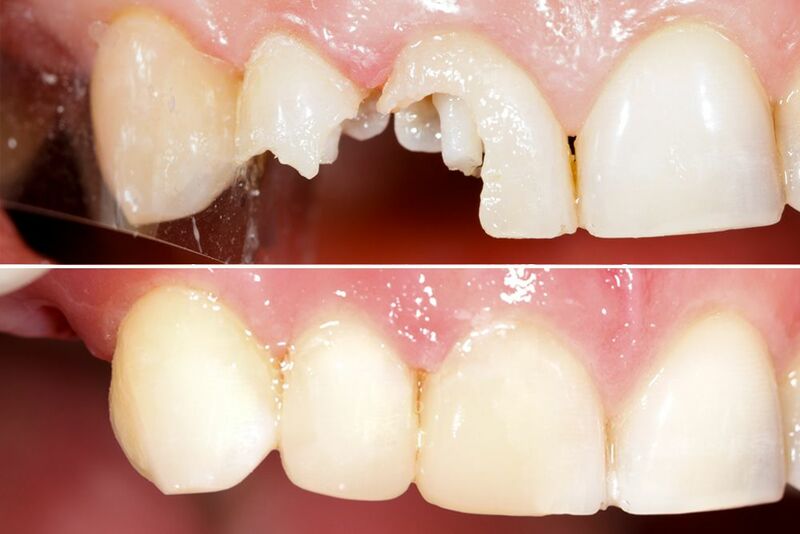 Dental bonding is best suited to patients with mild to moderate damage to the front facing teeth. Dental bonding is less costly than veneers. Dental crowns: Dental crowns are custom-made porcelain caps that completely encase the chipped tooth. Crowns are recommended when damage is particularly severe. They may be recommend for chips to the anterior teeth or molars. Inlays and onlays: Inlays and onlays may be used when a patient chips the biting surface of a molar. These restorations are custom made out of porcelain, and cemented onto the molars. To find out which treatment is right for you, schedule an appointment with Dr. Mateja.